Aqua Expeditions, the leader in luxury small ship cruising, is reporting strong bookings from Australia and New Zealand for its new Aqua Mekong cruises, which commence 30 September 2014. Aqua Mekong will be the cruise operator's first vessel in Asia, taking guests on a journey on the Mekong River, between Cambodia and Vietnam on a 7-Night Expedition Cruise, 4-Night Explorer Cruise and 3-Night Discovery Cruise. Aqua Expeditions was the first adventure travel company to introduce 5-star luxury cruises to the Amazon River in Peru on Aqua Amazon and Aria Amazon. Aqua Expeditions CEO and Founder, Francesco Galli Zugaro said forward bookings from Australia and New Zealand for the new cruise offering “are strong across the 3, 4 and 7-night sailings”. “These will be important markets for Aqua Mekong and, as we anticipated, a number of bookings have come from guests who have travelled with us before on our Amazon cruises and are looking forward to this new boutique cruise experience on the Mekong, “Mr Galli Zugaro said. Introducing a new standard of luxury and sophistication to the river, Aqua Mekong will be in keeping with the style of Aqua Amazon and Aqua Aria - small enough to be intimate but equally spacious and luxurious. The attention to detail for which Aqua Expeditions is celebrated for will be reflected throughout; from the design and décor to the cuisine and service. 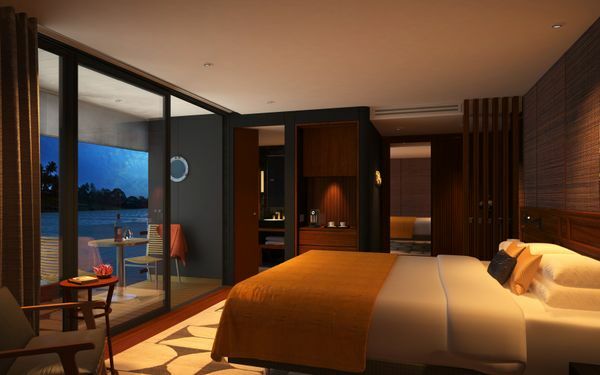 Aqua Mekong has been designed by Saigon-based architectural firm Noor Design. Measuring 62.4 meters (205 feet) in length, Aqua Mekong will have 20 outward-facing design suites with floor-to-ceiling windows enabling guests to relax and watch the scenery float by. Each will be decorated in an authentic Asian style using locally sourced fabrics and materials. Upstairs on the Observation Deck, guests will be able to slide onto sleek contemporary interpretations of the region's woven cane planters chairs, and at the Outdoor Lounge guests can unwind on cushioned lounges or ease into the river facing plunge pool. The pool's shimmering oasis will offer welcome relaxation after an Aqua Expeditions' excursion shopping for ingredients with the chef in Cambodia's wet markets, watching traditional silversmiths at work or spending time amongst snakes and crocodiles at a Vietnamese riverside farm. Aqua Mekong is also the first cruise ship on Southeast Asia's greatest river to offer a generous sized spa and fitness centre, library and screening room. Aqua Expeditions has appointed celebrated Australian culinary identity and Michelin-starred Chef, David Thompson as Executive Chef of Aqua Mekong. David gained an outstanding reputation for innovation and creativity in cuisine excellence in Australia starting with Sydney restaurant, Darley Street Thai, which he opened in 1991 and was voted Best Thai Restaurant for eight consecutive years in The Sydney Morning Herald Good Food Guide, before going onto continued success with Sailors' Thai in Sydney's The Rocks. Next came Nahm London where, in 2002, David secured the first-ever Michelin star awarded for Thai cuisine. Two years later, he moved to Bangkok and in September 2010 opened the renowned Nahm Bangkok, recognised in 2012 and 2013 among the 'World's 50 Best Restaurants' by Restaurant Magazine UK. "As Asia's top ranked chef on 'San Pellegrino World's 50 Best Restaurants,' David is the perfect fit for the exclusive Aqua Mekong, because his unique culinary experience and first-hand knowledge of Asian ingredients and palates will enable us to provide guests with the authentic experience they expect from an Aqua Expeditions cruise,” Francesco said. With a reputation for first-class cuisine influenced by Southeast Asia, Thompson will create a menu including local ingredients such as Khmer Kampot Pepper, Mekong River Prawns and Catfish, as well as fruits and vegetables from the markets of Saigon, Phnom Penh and Siem Reap. Among the many dishes will be River Prawns with Ginger, Shallots, Tamarind and Palm Sugar served on Betel Leaves, and Cashew Nut Pudding with Coconut Cream. "Working with Aqua Mekong will be an exciting challenge and the food will be based on the cooking of Thailand, Cambodia and Vietnam, the countries which depend on the Mekong River,” David said. “I look forward to setting sail." In keeping with the standards of the world's best bars, Aqua Mekong's Bar program has been designed by award-winning Proof & Company. Offering a unique 'village to table' concept, the bar will showcase rich flavours, colours and cultures of the Mekong River Basin along with the leisurely and romantic drinking rituals of colonial Indochina. Making daily forays to the markets along the cruise itineraries - where traditional spices, fruits and vegetables often change with each village - on-board bartenders will handcraft a rotating selection of cocktails that will feature artisanal spirits, hand-cut ice, and fresh ingredients. Drinks served will include Kentucky Cha Cha, combining hand-toasted Mekong Spice Blend with Organic Ceylon Tea, fresh pressed Coconut Milk and artisanal Bourbon and Kampong Old Fashioned made with Plantation Single Island Grenada 2003, Organic 'Kampong Speu' Palm Sugar, Pandan Leaves and Angostura bitters. In addition to these cocktails, the indoor and outdoor lounges will offer guests an impressive collection of artisanal whiskies, rums and other fine spirits and a carefully curated selection of boutique wines, local and craft beers, fresh-pressed tropical juices and handmade sodas. In just seven years, Francesco Galli Zugaro has cultivated Aqua Expeditions as a recognised leader in luxury small ship cruising. In 2008, Francesco launched the first luxury cruise line on the Amazon River in Peru with the 12-suite Aqua Amazon, and then the 16-suite Aria Amazon three years later. Nature-based guided adventures, sophisticated 5-star boutique accommodation and gourmet cuisine are hallmarks of both cruises. On 30 September 2014, building on the growing interest among travellers in small-ship cruising, Francesco will launch a third luxury vessel, the 20-suite Aqua Mekong on the historic Mekong River between Cambodia and Vietnam. or contact your nearest travel agent.